The Aerotenna team has successfully flown a quadcopter equipped with OcPoC™ that uses Aerotenna’s μLanding™ for sensing above-ground-level altitude. The testing included flying the quadcopter over many different surfaces including pavement, grass, sloped surfaces, and even water, to fine-tune μLanding™’s distance detection algorithms. Aerotenna has completed the whole integration of ArduPilot flight control software onto OcPoC™ interfaced with μLanding™. The modified ArduPilot program uses μLanding™ as its primary altitude sensor and gives above-ground-level altitude. This new system was integrated with the Mission Planner ground control station and the altitude data could be monitored. 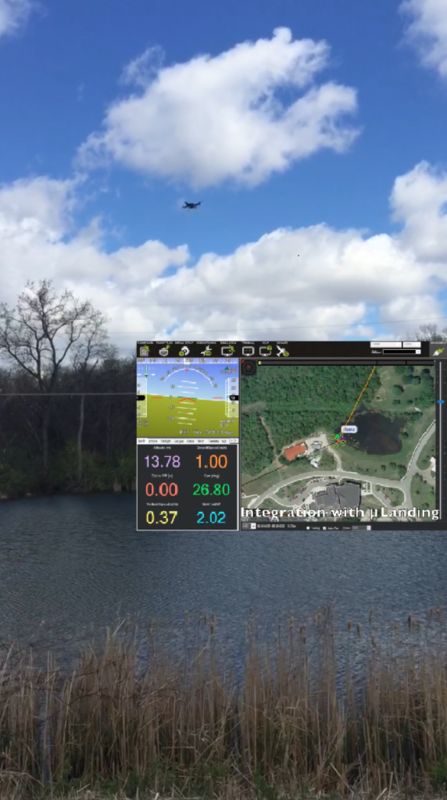 The attached images show the quadcopter flying over water with a real-time altitude reading from μLanding™. The microwave technology behind μLanding™ gives it many advantages over traditional sensors, and can give accurate readings above almost every surface. μLanding™ is efficient in size, cost and weight. Aerotenna plans to release μLanding™ as an affordable upgrade for any UAV system. Check out Aerotenna’s sensors page for more details and specifications on μLanding™.